« Fall in Love With the Peaceful Earth Bracelet! Decide the length of your original section of chain by either measuring or counting the links of your chain. This piece of chain is 11 links long. String your cut section of chain onto a head pin or piece of wire. String your remaining chain onto the head pin or piece of wire. Line up the links and cut the chain to the same length as the original section of chain. Repeat step 4 for the next piece of chain. Continue until you have the desired number or chain sections needed for your piece. And there you have it! 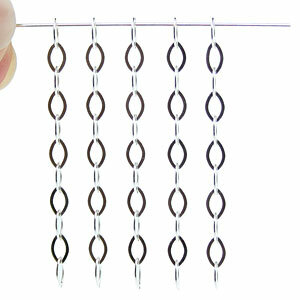 Now that you can cut chain efficiently, you’ll have no problem creating trendy chain-focused jewelry designs! Good tip. Will be using that and returning for more. Great tip! It appeared as though you cut through a link each time, is this so? Great tip! I was using the counting method! Yes, Dhanpati, that’s true! We’re glad that you appreciate the tip!